Francesco Onofrio Manfredini is one of those Italian composers of the baroque era who is overshadowed by his contemporary Vivaldi. Every year a number of discs with music of the latter are released however Manfredini's oeuvre is seldom performed and recorded. It is telling that ten of the twelve sinfonie da chiesa from his op. 2 are recorded here for the first time. In fact, there is a good reason why he is not that well represented in the discography: his extant oeuvre is very small. He must have written some music for the liturgy, but none of that has been preserved. The titles of nine oratorios from his pen are known, but all are lost. Manfredini was born in Pistoia in 1684, the same year in which his father had been appointed as a trombonist at the Cathedral. It is possible that Francesco received violin lessons from Giovanni Buonaventura Viviani who was maestro di cappella in Pistoia from 1687 to 1692. It is documented that he studied in Bologna with Giuseppe Torelli and Giacomo Perti. At several stages of his career he was in one way or another connected to Bologna. 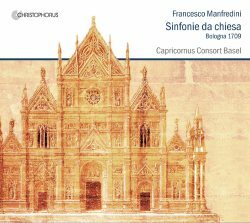 After some years in Ferrara he joined the orchestra of the San Petronio in Bologna where he stayed until 1711. In that year he became attached to the court of Antoine I Grimaldi of Monaco, where he acted as a composer and performer until 1723. The next year he was appointed maestro di cappella at Pistoia Cathedral where he remained until his death. His time there was not without considerable trouble, caused by regular conflicts with the cathedral chapters and the musicians of the chapel. Four collections of his music were printed, and the fact that three of them were printed in Bologna attests to his close ties to that city. Manfredini is best-known for his 'Christmas concerto', the last concerto grosso from his op. 3, printed in 1718. Nine years before that he published his op. 2, again a collection of twelve pieces, this time called sinfonie da chiese, and also ending with a piece for Christmas eve. These sinfonie are intended for performance during the liturgy, for instance during Vespers or as a replacement of parts of the Proprium of the Mass. They are all in four movements, following the model of the Corellian sonata da chiesa. As with those sonatas the second movement usually takes the form of a fugue. The scoring leaves various possibilities as Joachim Steinheuer explains in the booklet. There are four part books for the strings and a separate part book for the organ. The viola part is optional; this means that these pieces can be played as trio sonatas for two violins and bc. If the viola is included these sinfonie can be performed with one instrument per part - as is the case here - but also in a larger line-up. In that case they are close to the concerto grosso, in particular regarding the indications of 'solo' in the violin parts. The score also includes instructions for the performance, especially in regard to dynamics, but in addition we see terms such as puntato and sostenuto. Some of these also appear in the titles of movements. This collection of twelve sinfonie includes lots of good stuff. Many slow movements are quite expressive, especially those that have the indication grave. The first movement of the Sinfonia IX in C which opens this disc is a good example. The ensuing andante is remarkable for the mixture of various rhythms. Manfredini often uses harmony for expressive reasons. That makes good ensemble particularly important, and that is one of the features of these performances by the Capricornus Consort Basel. The two violinists are impressive in their exploration of the expressive traits of these pieces. Through their subtle treatment of dynamics they emphasize the rhythmic pulse. The fast movements are lively and engaging. In short, this disc is a substantial contribution to the discography: nice music, well played and recorded. The liner-notes tell us all we want to know about Manfredini and his op. 2.